This is another post for the pico-economics bucket, i.e. the schemes we use to control our impulsive nature and the difficulties that arise from them. This story has been getting a lot of media play. Under the “guy hires girl to slap him if he goes to Facebook“, but the actualy thing he hired her for is more interesting – at least to me. So I recommend the entire posting. This entry was posted in pico economics on October 25, 2012 by bhyde. Apparently the distribution for the interval between epileptic seizures is a power-law. The long intervals are rare. There are lots processes that give rise to a power law distribution. The proposed model in this case involves a cascading failure in the network of neurons. 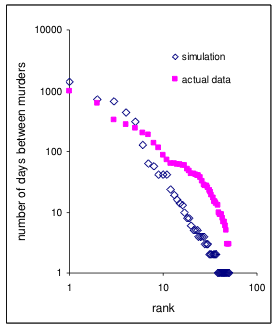 I don’t think this next paper has undergone peer reviews, but in this paper they look at the interval between a serial killer’s murders. That’s a thin data sample. The interval between his crimes is power-law distributed. Interesting example of impulse control, will power power, etc. I wonder if we have other data on brainstorms? Brainstorms of a less horrific kind: interval between blog posts, emails, phone calls, code commits, sales closed, etc. etc. What if we took the top hundred poems Robert Frost wrote and measured the interval between their creation? Would we see that as power law distributed? 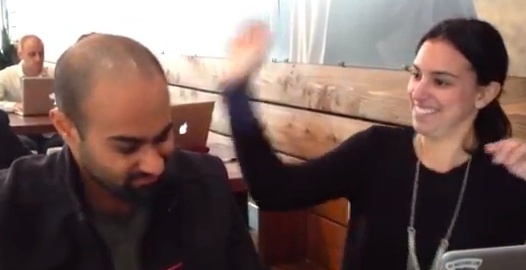 With enough data we could probably look into the effect of coffee on brainstorms. This entry was posted in pico economics, power-laws and networks on January 16, 2012 by bhyde. It appears that AJ Jacobs is writing a book on self experimentation and this very lovely article on managing the many daemons in your brain is a portion. It is a good addition to the thread about self control and attention management. My favorite bit involves a shocking idea. Language evolved so we could talk to ourselves. Or, I’d say, so our various inner daemons could talk to each other. I even find myself wondering if one of them didn’t stumble upon it and discover it now had a huge competitive advantage over it’s siblings. The less shocking, but still fascinating, is that one way to keep your attention focused is to talk – preferable out loud – about what your doing. This entry was posted in pico economics on June 12, 2010 by bhyde. One of the things that puzzles me about the vast literature on organizational dynamics, self control, will power, etc. etc. is that it seems to ignore an important reality about actual work. In my experience work comes in two flavors – everything is going just fine v.s. stuck. In the first mode you think you to know what your doing, the tools are reasonably helpful, and the problem at hand is receding as you work on it. That’s not to say the work is easy, it’s still work – unless your so lucky as to fallen into flow. But in the other mode one or more of these has decided to leave the building. Users of complex tools are familiar with this bimodal problem. if you use any powerful desktop application (a Microsoft product, or an Adobe product for example) then you’ll have often experienced the second mode. We have all lost a day or two trying to figure out how to make page numbers work, the bibliography to appear correctly, etc. etc. These are examples where our skills and the tools conspire to push us into the second mode. The no progress mode is being made mode. The more you push the edge of your skills or adopt new tools, or work on fresher problems the higher the chance your going to fall into this second mode. I suspect some trades spend large portions of their work lives in this second mode. It is trivial for an outside observer to misdiagnosis the second mode and describe the situation as not working. He’s happy to point out that no progress is being made. Duh! And he’s happy to dust off all the usual suspects; e.g. moral failings of various kinds. You can see occasional hints that this or that an organizational scheme addresses this by the appearance of terms like “management reserve,” “friction.” In Scrum the use the term velocity. But none of these dare to admit that work falls into the second mode. None of them speak to the puzzle of how to estimate the probability of entering the mode. None of provide any advise for picking apart what is happening in the mode, which is a precondition for getting out of it. The skills for thriving in this mode might be called persistence. That’s really a distinct skill from skills that keep you on task in simpler times. At least I think so. The will power to maintain focus is somehow different than the willpower required to survive a long period this second mode where no measurable progress is being made. And while persistence is one strategic approach an alternate one could be named agility, aka change course. Again the moralistic outside observer might see that as quitting. The complementary pair of persistence and agility reminds me of Levy walks. This entry was posted in natural-world, pico economics and tagged via-postie on February 18, 2010 by bhyde. Arising from my interest in impulse control, hyperbolic discounting, and will power I have been nursing an interest in how people enforce their personal rules. Say you wish to promise to go to bed at 10pm, or not to drink before 5pm, or to save 10% of your income, or call your mom once a week what tools exist to help you keep those promises. The literature highlights the amusing point that you can’t write contracts with your self as the counter party and then expect to have recourse to the courts when you break those contracts. If you keep your eyes open you will notice assorted tools for self binding. To do lists, reminder services, and date books are simple examples. There are software applications that will lock out your internet access. There are savings plans that include a penalty for early withdrawal. In Arizona you can sign onto a list that requires the casino to deny you access. Some of the promise keeping aids involve enlisting a third party. There is a horrible scheme that addicts fall into where they enlist a friend and license him to punish them in some awful manner if they break their promise. For example they might write a letter which will ruin their professional life if revealed and then give it to the third party. Once you introduce the third party there is all kinds of risk for abuse. The third party might extract a promise from a victim during an irrational moment by coercion. A light weight example of that is how the salesman at the health club pressures customers into signing up for a subscription. And then, there are chastity belts. Some of these promise or binding technologies are designed to remove the temptation entirely. For example: living in the dry town, never buying the liquor, and avoiding the pub. And those come in degrees – for example moving the ice cream to the back of the freezer. I’ve been stewing on what might be the lightest weight service a third party could offer to help individuals with this class of problems. And I have a theory. It’s based on the time-lock example used for bank vaults. In that case the bank want’s to remove any possibility of opening the vault for some period of time – usually while the bank is closed. While obviously the bank’s intent is to keep criminals from stealing their money they actually promise not to open the vault under any circumstances. They are self binding. They could of locked the vault with a one time password and given it to a trusted officer of the bank. They don’t trust themselves. Apparently the only thing they trust is the people who built the vault. It’s interesting that if you look at pictures of these time locks they are usually in transparent cases so anybody can visually inspect the mechanism. They are over engineered and simple which encourages that inspection. Say you wanted to lock up a present for christmas day. You put it in a safe, put it under the tree, and christmas morning you hand the key to the recipient. But what if you want to wrap up a present for yourself and you don’t trust yourself not to open it too soon. Now what? You could ask the help of a friend, but that’s got other complications. Can you solve this problem without a third party? You could if you could buy a time-lock. I’d love to know of a vendor. I’ve not found one. I find that bizarre; surely there are lots of people who’d like to lock things overnight etc. Anyhow, I’ve built one for you. It’s based on a bit-o-crypto. You lock up things up by encrypting them, and later when the timer runs out you can decrypt them. Frustratingly this does involve a third party, my little service. You get the means to encrypt by going to the service, and later once the timer has run out, you go back to get the means to decrypt. This depends on public/private keys. You use the public key to encrypt and the private key to decrypt. For example say you want to make it much harder to play that damn addictive video game until next tuesday. You go grab the public key for next tuesday and lock away the damn game by encrypting it. Next tuesday, or sometime after, you go grab the private key and decrypt the stupid game. Of course this requires that you trust me to keep the service running and not loose the keys it gin’d up. I wouldn’t recommend trusting me, yet. For example I really haven’t tested it much :). Here’s the service http://hang-on.appspot.com/. I’d love to hear suggestions for things to do with this, or ways to improve it. This entry was posted in pico economics, programming on November 22, 2009 by bhyde. I’m liking these thin skinned vaults. People used to do amazing things with bricks and tiles, and folks at MIT are working to bring it back. 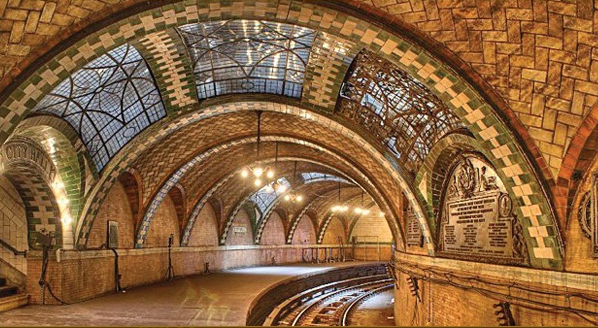 In the US we have a lot of amazing tile/masonry buildings via the work of Guastavino. And, have look at these mostly abandoned buildings in Cuba, also via satellite. One contributor to these techniques falling out of favor was rising labor costs, but also a lack of tools for doing the structural analysis on them and, in turn, a lack of building codes. 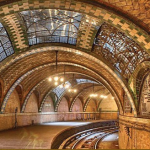 There are thrust lines that flow thru these arches, and they had better stay inside the masonry, otherwise it’s going to crack. A single layer of tiles might be only an inch think; so best to know what your doing. The folks at MIT think they have that problem solved. These building suggest their right. Try it yourself. From Aspen Aerogel, click to enlarge. I’m also liking Aerogel insulation. When I was a kid it was well know that the down of goslings, preferably from a Scandinavian goose, provided the worlds best insulator. Man had yet to create a better tangle for capturing air and frustrating heat. Nature is still doing well in that race and I still own a down winter coat. But, it was lie. In the 1930s chemists invent this stuff Aerogel. It’s a solid consisting of nothing but fibers of silica. It’s rigid, almost transparent, quite brittle, and extremely expensive. But it’s practically opaque to heat, so NASA wanted to use it and they funded a mess-o-research. These days you can buy small insulating panels of it so when you ship whatever in dry ice you only need to put but a tiny bit of ice in the box and it will stay cold for days. 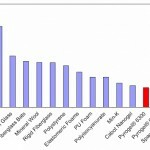 You can get insulating batts of this stuff in various forms for around 3-4$ a square foot from Aspen Aerogel. But those aren’t as perfect an insulator as the solid blocks. You can also buy it in granular form for poring into spaces (Cabot). Not as fine an insulator as the insulating batts this stuff can be nearly transparent so it gets used in skylights, exterior wall panels, and inflated or tension roofing. You can also buy a slice of it wrapped up into liners for your shoes, a pad for sitting on the cold bench at the game, or for keeping your hot laptop from scalding your legs. My favorite application is in these personal air heat exchangers. 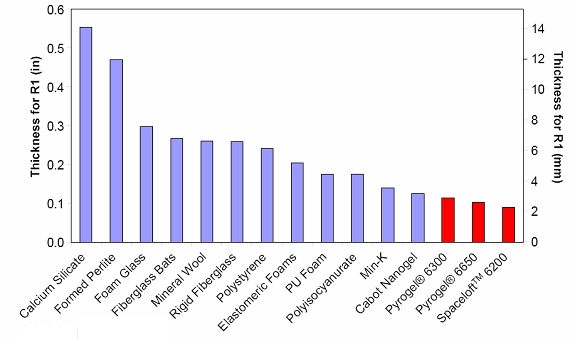 There is a nice overview of various kinds of insulation here, which shows that the aerogel products have some near competitors; not mentioned though are these delightful batts of wool insulation, I like ’em. I like this video demonstrating the hyperbolic discounting problem. But the popular articles about this experiment are horrible. They don’t actually explain how universal the problem is nor do they bother to give any hints on how to deal. In this video the only means left to these kids is manipulation of attention, and even that was incredibly limited. I assure you, this experiment would work just as well on adults. And, I’m liking my name sake, I need to make a visit. This entry was posted in natural-world, pico economics on October 16, 2009 by bhyde. Chris points out a provocative idea. No doubt I’m getting this wrong, I’ll need to read the paper (pdf). But the idea is that an animal’s problems with hyperbolic discounting are more severe for some goods v.s. others. Further the poor tend to live in circumstances where the goods most effected by the problem account for a large slice of their consumption. That smells a bit like a tautology to me, but yeah. So this raise the idea that the rich have all their impulsive desires met, well before they get into serious money. Well serious money for them. For most of their money they then act in accordance with the more functional exponential discounting. It’s not that the rich are different from the poor, they are just luck enough to be able to pay the tax demanded by their inner dysfunctional investor. This entry was posted in pico economics on September 15, 2009 by bhyde. Cars get into accidents. Adding cars to the system increases the number of accidents. The paper discussed here argues that adding a car in a high traffic state adds about $2,500 worth of additional costs, almost $7 dollars a day! Here in Boston, a bus/subway transit pass costs a bit less than $2/day. My somewhat dated estimate of the cost of car ownership was $13/day, of which $1.25 was insurance. Of course that $7 is at the margin and the insurance isn’t. The authors suggest using Pigouvian taxes as a way to reveal the true costs of their $7/day externality. Sin tax is the common name for Pigovian taxes, i.e. taxes that are designed to bring market forces to bear on behaviors that are high cost in the big picture but appear to be costless as they are being engaged in. The authors suggest a gas tax or a change in how insurance is priced. Per-mile charging would be preferable to per-year charging. There is a trick some groups use to get people to show up on time. They set out a jar and if you show up late for the meeting your required to quietly deposit a dollar in the jar. That’s a Pigouvian tax. Otherwise the guy showing up late is inflicting a coordination cost on everybody in the room. He’s getting a free lunch. Later you can buy everybody a free lunch with the content of the jar. This can backfire :). Tax design is a fascinating puzzle. Lots of dimensions! One dimension that is often ignored is how easy it is to avoid the tax. Back when I lived in NYC it was common to observe cars who’s license plates signaled that my neighbors had registered the car at their summer place in Vermont. Here in Massachusetts it’s common to slip over the border into New Hampshire to buy larger items sales tax free. A friend of ours reports that the current tight credit situation has move more of her income into the cash economy. Just as we are doing more behavioral advertising, as technology lowers the cost of close monitoring and erodes our privacy we can do more of behavioral taxation. Charge those guys that grab a free lunch by darting thru the intersection after the light’s changed. The public will have mixed opinions about all this, but framed right they are likely to like the idea of taxing behaviors that have high externalities. The congestion pricing schemes for cities are an example of this. Are we at a tipping point for this stuff? I’m surprised that the current crisis hasn’t triggered any (?) moves in this direction. How hard is it? For example, most states have managed to get most of their drivers to adopt their drive-by toll collection systems. They could make that manditory and institute a mess-o-tolls. I’m confident it wouldn’t be hard to repurpose that system to catch red light scoff laws. Or states could use their drivers licenses to raise taxes on people who have a problem with alcohol. They could even do that entirely on an entirely volunteer basis, following the model that Arizona uses where people can sign up to be barred from entering casinos. I’m amazed that not a single state has raised their gas taxes. Many states have raised their sales tax. Treating undifferentiated consumption as a greater sin than driving seems bizarre to me. Sales taxes are also a very regressive tax. I don’t know how this will work, but you can play the design your own Pigouvian tax game here. That uses moderate.google.com, which lets you post issues, collection ideas, etc. I’ve posted some things that have short term pleasures for those who do them, but longer term costs for the rest of us. Feel free to add others and possible Pigouvian taxes to compensate. This entry was posted in economics, pico economics, politics on August 3, 2009 by bhyde.